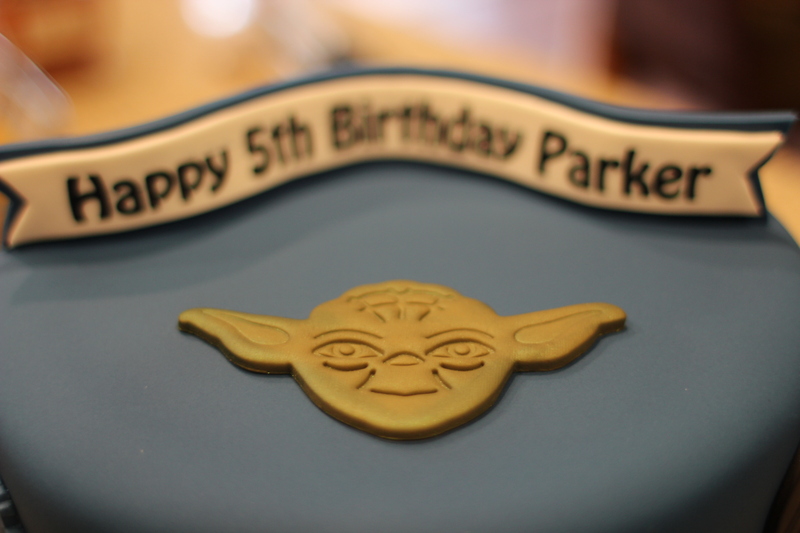 This weekend we celebrated Parker’s sixth birthday! Wohoo! He’s growing so fast, and I just love watching him year by year learn and grow. This year, he has really been into Ninjago, a lego ninja series that has lego sets, and a cartoon show, as well as books. So, we thought he would enjoy a ninja party at a local Karate center, and let a pro teach him and his buddies the ways of the ninja! In addition to learning Karate moves, they learned about stranger danger, how to block moves, and Parker got to break a board, as well as cut his cake with a sword! As if that wasn’t enough, all the kids got to take a swing at Lord Garmadon Piñata, which they all loved! We enjoyed every minute of celebrating Parker. He is SO worth celebrating. He brings us all so much joy. He has such a happy spirit, and positive attitude, and I am so thankful he’s apart of our family. 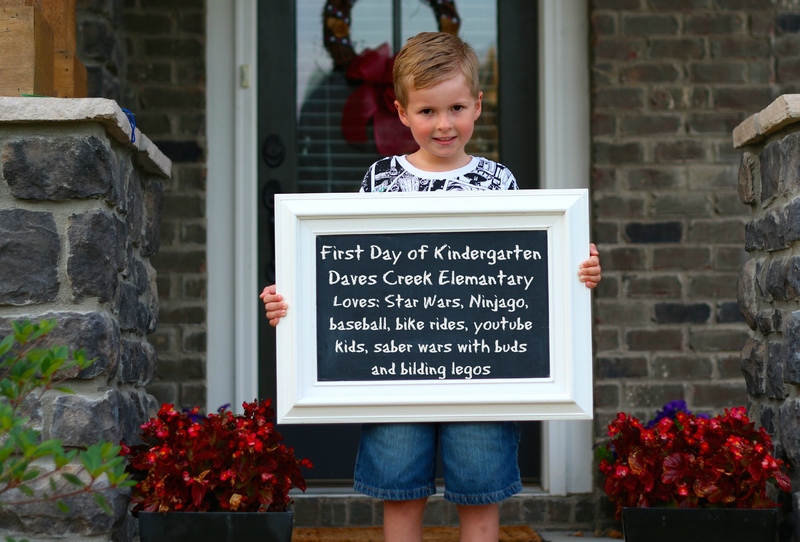 This back to school season was a big one for us because Parker started Kindergarten! Parker was super excited to go, but I was a mess. A. MESS! It’s yet another reminder how fast he is growing and how our time is so precious while they’re young. He’s so ready, with him approaching six, he waited as long as possible with the cut-off date being August first (thank goodness!) he had to wait one more year before starting. So, with me having more jitters that Parker did about him starting this new endeavor, we thought it would be fun to make bracelets together so that he could remember me while he was at school, and so that I would feel comforted when I started feeling sad about him taking such a step in going to big kid school! It also helped that he has lots of friends that joined him on the bus, too. I don’t think I would’ve been so accepting of doing the bus if it wasn’t for the fact that there were so many people we knew riding. Also, I heard that it was strongly encouraged because of the super long carpool line during drop-off. It was still really hard for me realizing the fact that I had to just let go of control and trust the driver of the bus, and his teachers and know that God was watching over him through all of it. I wasn’t so sure about the bus on the first day because the windows were so tinted on the new bus models, that I couldn’t even see where Parker went, much less wave to him as they drove away. Not exactly what I had envisioned. I called the bus driver mid-day (I know… I was THAT Mom) but it really helped calm my fears to talk through some of the things that made me nervous (no bus numbers, not seeing my son in the first few rows like he promised, no adult “helper” on the bus to help get the kids seated, etc.). So far, Parker has loved school and has made lots of friends. That part usually comes easy for him! Maybe a little too easy, actually. There is a neighbor friend that is in his class that he didn’t know well, but they quickly became good buddies. The two of them had to be separated for excessive talking and goofing off in class. It doesn’t surprise me a bit because Parker may be the goofiest out of all the kids and he doesn’t miss an opportunity to make someone laugh or be silly! It’s almost to his detriment. While I love his enthusiasm and positivity, he lacks the self control at this age to harness it and only use during appropriate times like recess, PE or lunch. He’s working on it though, and I am confident that his positive attitude will serve him well as he grows and matures. So, the first few weeks we got a few frowny faces on his behavior chart, but we have since worked through these issues, and I am super proud of his recent efforts of self control and focus in the classroom! I’m coming to terms with the fact that my boy is growing up. He’s going to be six in a few weeks, and he’s becoming more responsible and his sweet personality shining through. He’s a great helper in the kitchen and he’s doing great learning how to keep up with his chores and duties around the home. I honestly couldn’t be more proud of who my sweet boy, my first born baby is becoming! I’m still learning about photography, and one of my favorite subjects to practice on is my three sweet kiddos! Here are some recent photos that I took with my Cannon 70D 28mm lens. I had the F stop at about 2.2. The F stop goes to 1.8 but I seem to get a lot of motion blur if I’m not focused enough and when I’m dealing with wiggly kiddos! My ISO is set low at about 100. I’m still learning about shutter speed, so I’m not exactly sure what that was set on. I’ve recently been “practicing” with Manual although I’m more comforable in AV mode simply because I feel I don’t know enough about shutter speed to know what I want to set it at in relation to lighting. Nevertheless, I had a great time capturing my sweet three in their Easter attire a few days before Easter! We bought some placemats from Amazon for the kids called painless learning and they’ve worked out so great! It has given them something to do while waiting for their food and everyone is learnings! Sienna still needs more teaching and direction, but she’ll get there! Parker has learned several more site words since this video was taken and he has really enjoyed sounding them out. Once he gets all the site words well, I add a few new ones for him to practice. I try to have him understand the phonics involved instead of him just memorizing the word itself. Mason has really enjoyed learning the states, and he too knows more (mostly western) states now. It’s worked out great in our family and I certainly recommend them! They have quite a few on amazon; Counting, anatomy, science, astronomy, ect. So fun! Bike Rides and Tball Hits! We decided to sign Parker up for Tball this year. We’re not exactly a sports family. What I mean by that is that nobody watches sports or talks about sports, and neither Dan or I went to a college that played a specific sport. Neither one of us or grew up playing sports. Well, Dan played soccer, gymnastics and karate as a kid so I guess those count. Dan went to Drexel U. a technology college and I went to an art school for college, so neither one of us jumped on the college football wagon or have an aligance to a particular team or sport. So sadly, Parker is at a disadvantage for any kind of sport in our house since he’s never even seen baseball on TV! I knew Parker would love it though because he has such a positive attitude and an incredible drive and energy. He’s always so positive and loves to play and compete at anything. Of course, since he’s never played he’s not that great at it. He doesn’t let it get him down though. He’s hit a few balls off the T, and last two games hit a piched ball! He still needs to work on his throw and his outfield behavior (he was throwing his hat in the air and trying to catch it with his head last game), but overall we are proud of him. Who knew being a Mom of a little boy was so much fun? We’re certainly having fun with this kid and I can’t wait to see how much he grows in this sport. He’s already asked if he can play in the spring too! The other day he got up from his nap and asked if he could watch baseball online, and see them drink Gatorade. Ha! He’s so funny! On Parker’s birthday, I told him that he’s five now, and that I thought we should try riding his bike without training wheels. We’ve tried once before on his big bike, and he was just WAY too unstable. So this time, we decided to take off the training wheels on Mason’s bike since it is smaller and lower to the ground. I worked with him on Sunday a little bit while Dan had a friend over and they were watching a movie and the two youngest were napping. I was EXHUASTED. Parker kept leaning and putting all his weight on me, and I was hunched over trying to keep him upright. He kept wanting to try, even though he kept falling. We probably got a balance of one bike length without him falling, but that was the extent of it. I was a little annoyed because he wasn’t really taking the whole bike riding thing seriously. He would laugh and laugh, and smile and then laugh. In hindsight I guess it’s better than him crying and giving up, but I just kept asking him to BE SERIOUS which is totally NOT Parker’s personality. I was talking to my neighbor Jenn about advice since she taught her son to ride his bike and the next day was a gorgeous afternoon, and the kids were all playing outside. Jenn and I took turns helping Parker start, and asked him to ride to the other person and JUST LIKE THAT. That was what he needed. A cheering person in front of AND behind him! He started going the longest distance that night, and two days later was riding down the street on his big bike! Such a proud Mama! Dan was impressed too, of course. 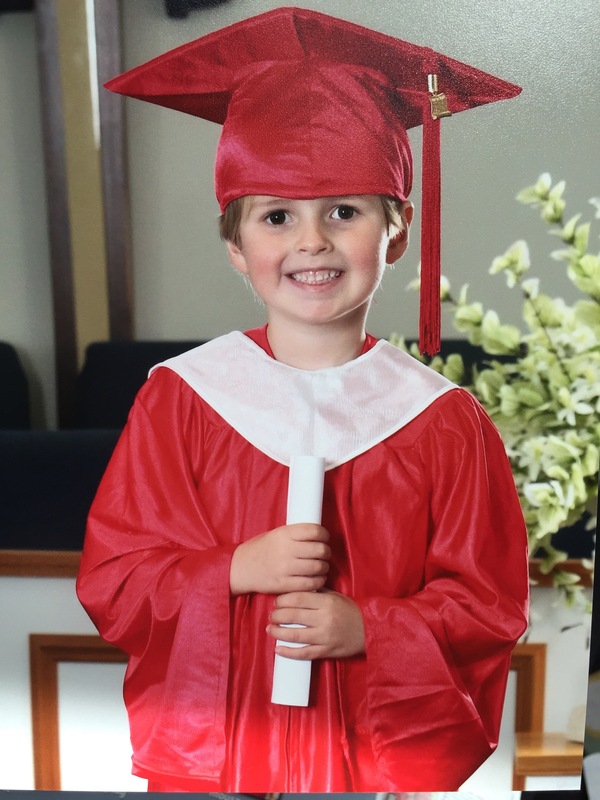 My boy is growing up! My first born is FIVE! This weekend was a great weekend. We celebrated our oldest boy turning five years old! It’s hard to believe that he’s such a big kid now. 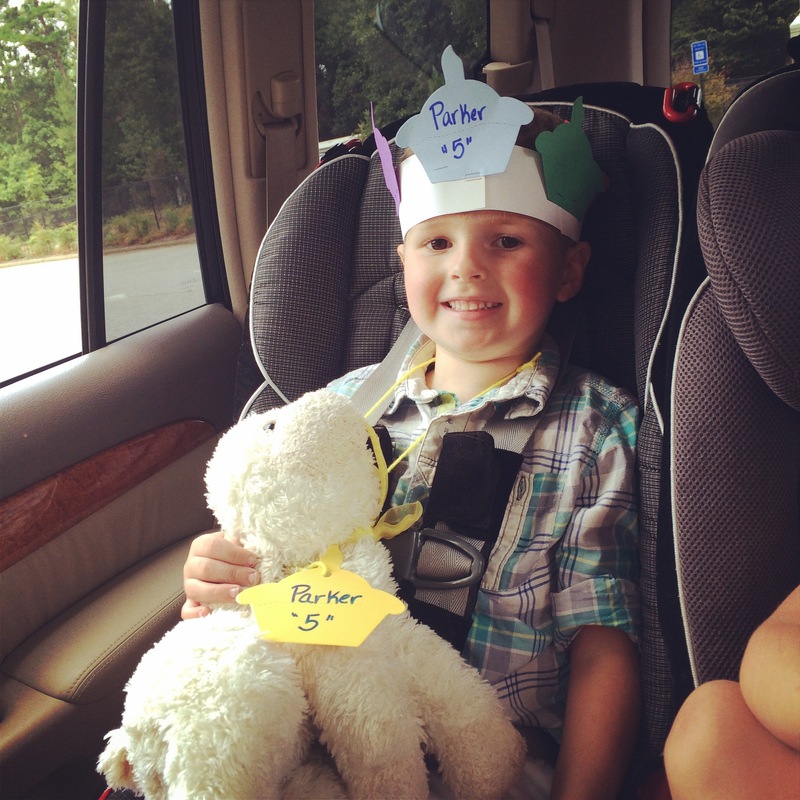 I stole these questions from Parker’s Four year old blog post last year. The answers are all different! The weekend started off great with Parker celebrating his birthday at school on Friday and getting to bring home “Lambie” the class mascot. Parker loved that and really had a great time bringing Lambie everywhere he went all weekend. Saturday, party time! The friends arrived on Saturday morning. My brother and nephew Gavin got in the evening before. Gavin is almost eleven, but Parker just ADORES him! Gavin is such a good sport too with all the little kids! 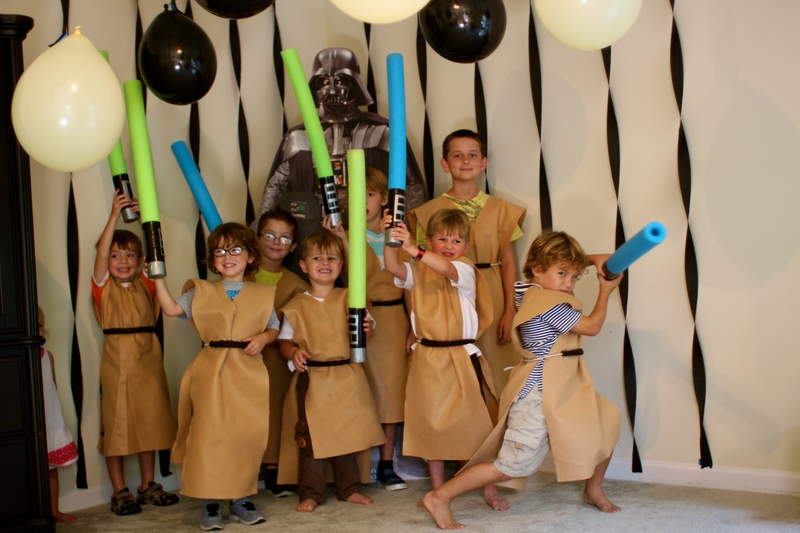 I made super easy Star Wars Jedi robes inspired from this post I saw on Pinterest:http://www.birthdayinabox.com/activity-guides/star-wars-party-craft-make-a-jedi-robe.html word to the wise though. Just measure your child for the Jedi/padawan robe before buying the fabric. I went by the 6×2 measurement and it was WAY too big, and had a TON of fabric left over. Super easy and no sew, which was great! I also made little pool noodle light sabers inspired by the taped up noodles on this blog:http://www.cleanandscentsible.com/2013/05/star-wars-party-ideas.html The kids LOVED them, and they had their own personalized noodles with their initials on the bottom to keep track of them. This year we had the parents drop off the kids. We did it this way for several reasons. First of all, they’re old enough. They’re all around five, almost five, or older. They really don’t need their parents at a party. Last year when we had Parker’s Super hero party, there were several parents mingling and not watching their kids. No fault of theirs… that’s just what happens at a party, but I just found it harder to keep tabs on the kids with more adults believe it or not. Another reason was that we would be watching a Lego Star Wars movie in the theater room, and it would just get too crowded with all the adults there. The party was a bit long with the movie, games, and lunch so I thought it would be more convenient for the parents not to have to tie up half their Saturday at a birthday party. It ended up working out great with just the kids there. Dan and my brother were both a big help with getting the food ready and setting up the games, as well as helping watch the kids, so that made it easier. Nine little boys and one 2 year old little girl made for a busy morning! So, it was a big hit! 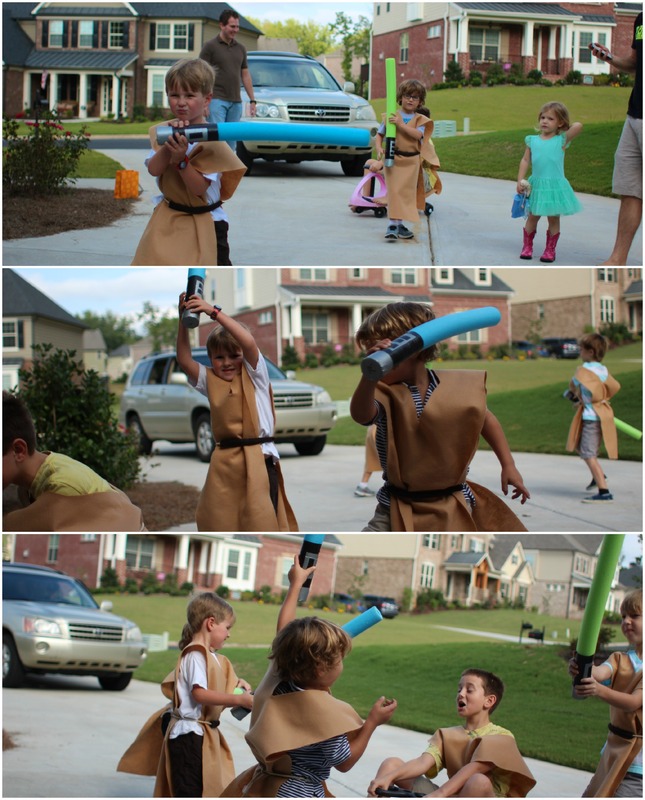 As the kids arrived, we played outside for a little bit (practicing their Jedi light saber skills) and each kid got their jedi/padawan robe. 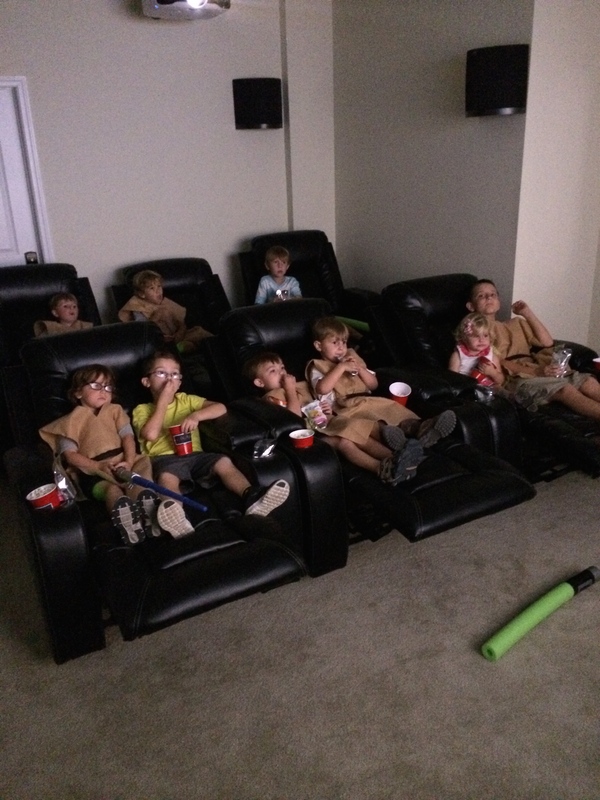 Shortly there after, we went down to the basement with popcorn and drinks in tow and watched Lego Star Wars and a short clip of young Anakin Skywalker flying a little ship in a race. The kids LOVED it. After that, we went upstairs to the playroom where I had decked the room out in balloons hanging from streamers. I told the kids that it was a “jedi training course” and they just loved it! They waited for the music to come on, which was the Star Wars opening song and the Darth Vader march. Not one kid was shy during this. The were all laughing and hitting balloons. It didn’t take long before they were all knocked down, and then they started hitting the balloons on the floor. Lots of fun with soft materials so no one can get hurt! Then we took the cardboard cut-out of Darth Vader outside where everyone got to practice their batting skills by hitting a balloon with their light saber to hit Darth Vader. Super fun! It was a little windy though, so I needed a helper to hold Darth Vader up so he didn’t fall down. Dan was busy cooking hotdogs on the grill while we were playing outside. The weather was perfect and the kids had a lot of fun, and ran off a lot of energy! They all came in shortly afterwards and enjoyed a nice hotdog lunch, and then of course there was cake and ice-cream, and singing to my five year old big boy! The cake was from a local bakery called The Crafty Cakery. 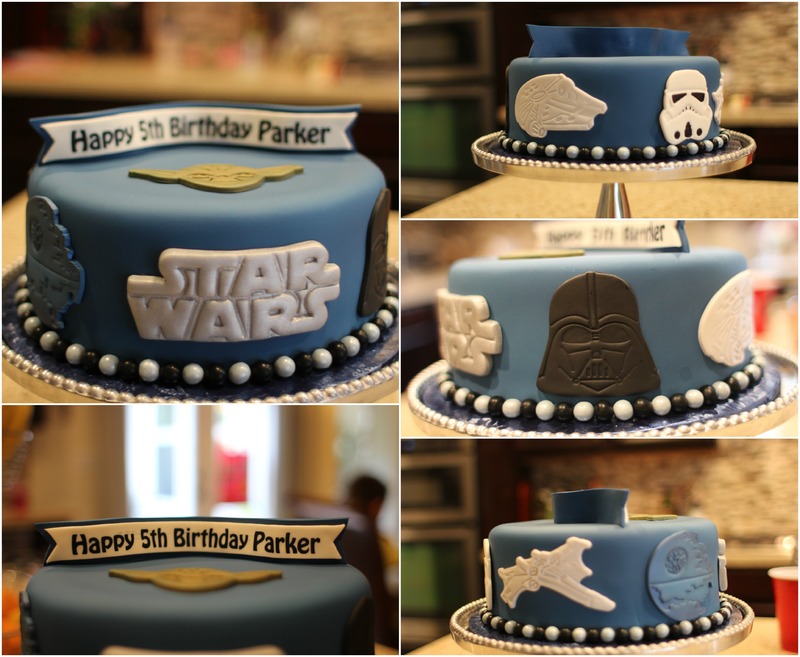 They did a fantastic job and it was exactly what Parker wanted for the party. Parker loved it! It tasted really good as well, which made everyone happy. This was a different place than where we got Dan’s cake because the Baker’s man is further away, and admittedly the cake wasn’t as great the last time we had it. 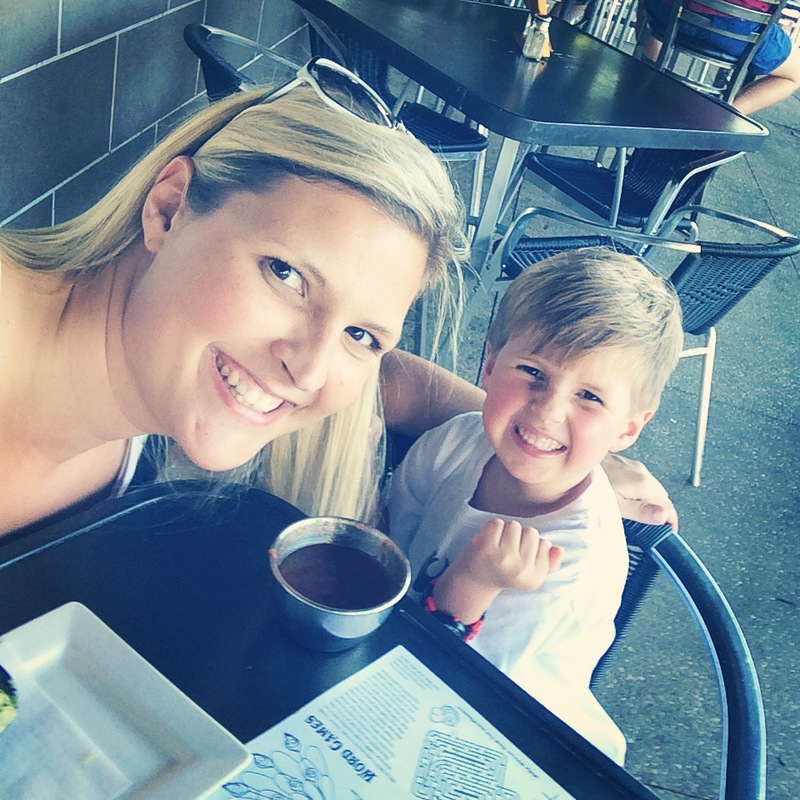 We liked trying a new place, and will certainly go with them again! Afterwards, the kids played some more and the parents trickled in to pick up their kids. 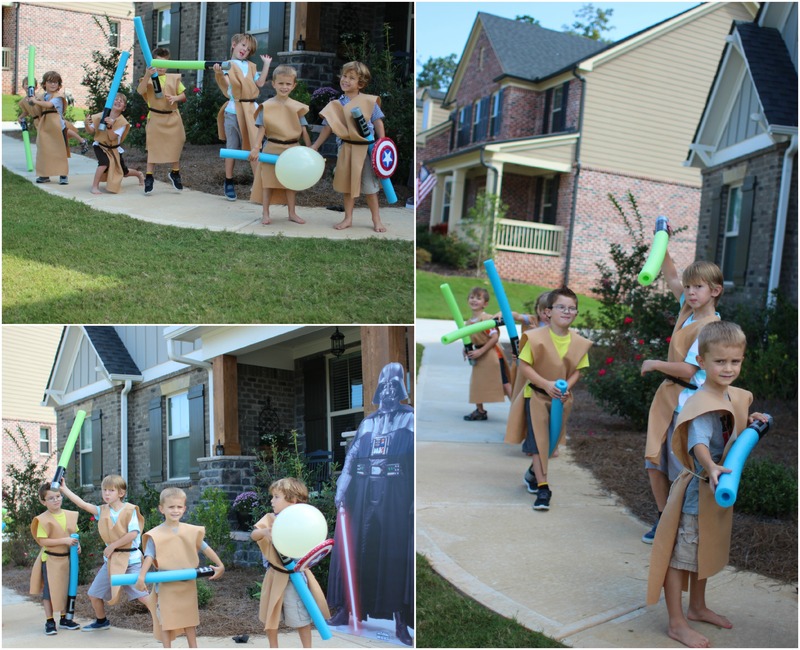 They each left with a Jedi Knight Certificate that I found and printed off from here: http://www.pinterest.com/pin/264093965624328053/ the boys really enjoyed having a certificate for the “Jedi training” they did! So much fun! 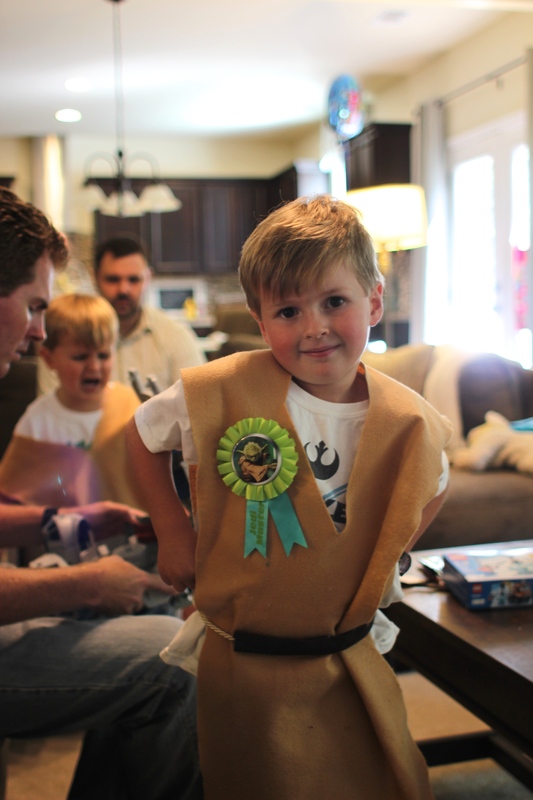 Parker got a badge that said Jedi Master on it, and he just LOVED it! Every year I say I’m not going to overdo it for parties, but I seem to get carried away with making sure my kids have a great birthday experience. This year was no different, but I also felt like it was a big age. Five is huge! An official kid! 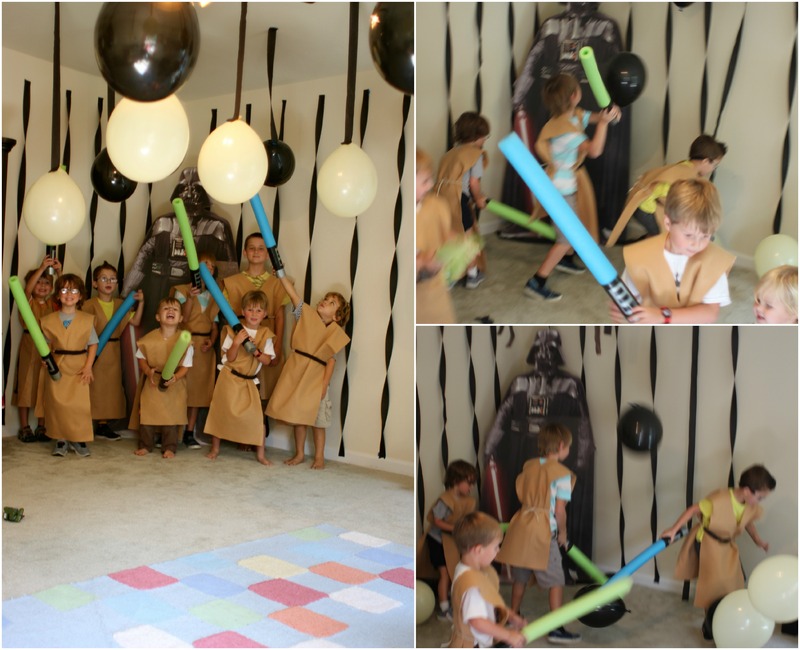 Plus, the party decor and ideas for a Star Wars party is just too fun to pass up! I had a great time putting on this party for him, and Parker had a blast having his best buddies over to celebrate with him! That evening we went on a little mother-son date to dinner and a movie. We had a great time, and it was a great way to end the day of celebrating our big boy!